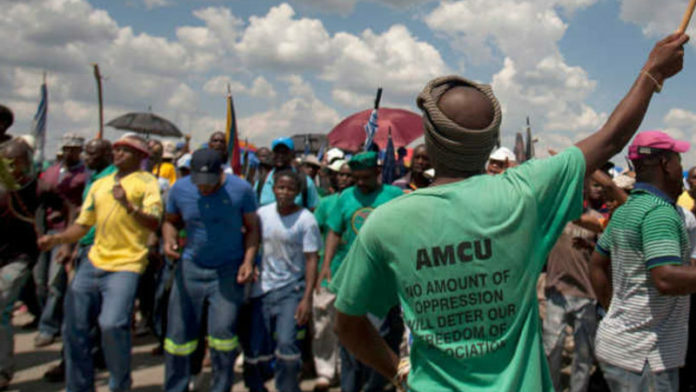 A CONSEQUENCE of the Association of Mineworkers & Construction Union’s (AMCU’s) four-month long Sibanye-Stillwater strike is that by the end of March the loss of income of the 14,000 striking union members averaged R56,400 per striking worker. In other words, the workers are striking themselves into a position of hardship and penury. They will never get those lost wages back. Minerals Council of South Africa warned recently that 90,000 jobs are in jeopardy in the platinum industry owing to a combination of strikes, poor demand, a drop-in production, and the rising cost of electricity. As wage negotiations in the platinum industry are about to start, all trade unions should take a lesson from AMCU’s poor judgement and make sure they are fully aware of the loss of income strikes bring. When employees embark on strike action, they forfeit their pay for the duration of the strike. Striking workers can accept this loss if, within an acceptable period, the success of the strike compensates for the loss of income during the industrial action. But if it’s going to take several years before a strike is compensated by the improved wages, then it’s better to accept the lower offer. To illustrate point, let’s assume there are 250 working days in mining a year of which a trade union has been on strike for ten. The aim is to extract a 15% increase from an initial 10% offer. It would be incorrect to claim that three months of the higher salary would cover R6,000 lost during the strike if salaries were only R1,875 per month higher. Matters become complicated when deciding which amount is to be used to calculate the actual value of the strike. The value of the strike is equal to the amount the striking employee scores as a result of the industrial action. This is not equal to the total monthly increase of R1,875 as it is only equal to the difference between the company’s original offer and the amount granted. In this instance, it would only be the 5% (being the difference between 10% and 15%) that comes into the equation; which in other words, comes to an extra R625 per month. It would take more than nine-and-a-half months before the loss incurred during the strike could be made back. Only then would the salary increase really mean anything. Further to this, a strike that involves 20 work days to achieve a difference of 5% means that the employee would have to work for 19 months to compensate for lost salary. If a strike goes on for 20 days to achieve a difference of 2% it would take almost 53 months or four-and-a-half years, to catch up – a fact the average striker in South Africa most probably does not realise. When a strike is being considered, trade unions and their members should first think about how long after the strike workers would be prepared to work to compensate for losses incurred during the strike. The decision whether or not to strike should be based on that. For trade unions such as NUMSA (National Union of Metalworkers of South Africa) and AMCU a strike is sometimes a tactical way of showing an employer that a trade union does not only bark, but bites too. Even so, the impact of a strike on members’ income should be considered before deciding to show one’s teeth. That is why AMCU’s Sibanye-Stillwater strike is illogical. In any event, Sibanye-Stillwater has also shown other employers that it will not pacify a dog that always wants to bite. It’s a sad day when unions forget where they come from, and who struggled to bring them where they are today. As is so fashionable to say in our mining industry these days, “Lest we Forget” – big words indeed. I definitely do not agree with this strike. Let me be quite clear about that from the outset. That said, there is a bit of a flaw in the logic set out above. Consider the impact in year 2. The next increase will be off a higher base than otherwise it would have been. And subsequent years’ increases are off an increasingly higher base than otherwise they would have been. I think this effect is known as “compounding” – you often hear financial gurus talk about “the power of compounding”. The mining companies will obviously not want to be drawn into this conversation. Indeed, it’s why mine costs have been increasing at such an alarming rate – they have been increasing in real terms for 40 years. But back then workers were paid a pittance. We have been “paying the piper” ever since then. That is one of the things that gave rise to the unions in the first place. Some might say; “you reap what you sew”?